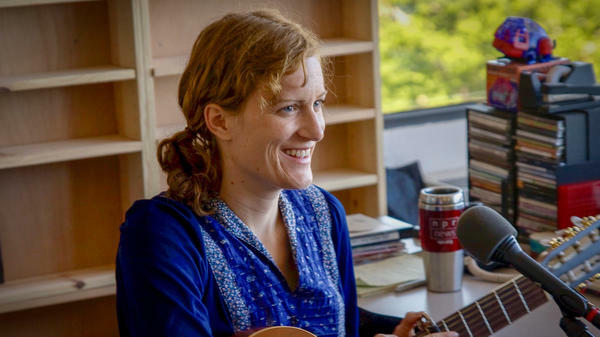 A decade ago, Laura Gibson kicked off the Tiny Desk concert series. Ten years ago today — on April 22, 2008 — NPR Music published our first Tiny Desk concert. Laura Gibson was the inspiration, and the event that sparked the idea of concerts at my desk came from NPR Music's Stephen Thompson. He and I were at the SXSW Music Festival, at one of those lousy shows where the audience chatter was louder than the performer. When Laura Gibson walked off the stage to talk with Stephen and me, we told her that we could barely hear a word she sang, and Stephen said something like, "When you come to D.C., we should just have you play at Bob's desk." For me, it was a lightbulb moment. Though Stephen's comment may have been a way to lighten the moment, as a former video producer and audio engineer, I thought his idea was genius. As you'll hear on this edition of All Songs Considered, for Laura Gibson it marked a turning point in a young artist's career. "I wasn't quite sure if music was for me, and that experience of having this terrible-feeling show and thinking, 'This is just not working.' And then to have this amazing thing come out of it!" And so on April 14, 2008, a slightly tentative Laura Gibson came to NPR to perform at my desk. As an introduction to the few who came to my corner of the NPR offices — then at 635 Massachusetts Avenue NW in D.C. — that Monday morning I prefaced the concert by saying, "Maybe it's the start of something, maybe not." Now, nearly 750 Tiny Desk concerts later, I think back and marvel at how that evening in Austin — that "terrible-feeling show" Laura describes — turned into a life-changing moment. To all the artists who have embraced this crazy idea and found a way to squeeze their setup behind my desk and brave the awkward daylight of an office, thank you!